MSys' Solution Accelerators are part of our QA and testing suite of tools. They focus on achieving accelerated time to market for your products, increasing your ROI and allowing frequent releases owing to concurrent automated testing from the beginning of the product development lifecycle. Mobitaz is an advanced android/iOS test automation tool. Mobitaz is the product of years of development at MSys, put together by our talented product engineering professionals, who have experience in a number of mobile test automation tools. Wider, more extensive support for iOS and Android: Support for native and WebView components, various hardware configurations, and OS versions from Gingerbread to the latest. For iOS, Mobitaz supports from version 5 onwards. Mobitaz is easy to use. Teams can expedite tests and deploy them. Maximized test coverage and tool robustness ensure better quality assurance and higher ROI for Mobitaz customers. 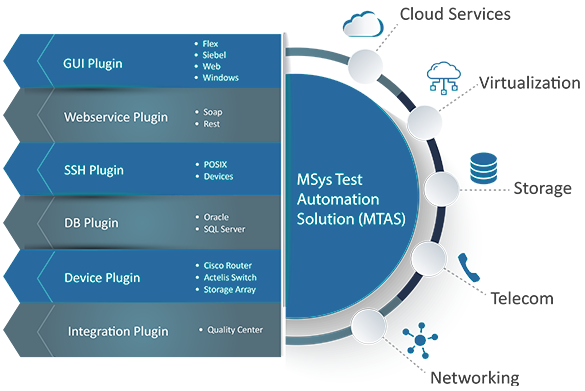 MTAS is an end-to-end MSys Test Automation Solution compatible with many applications. MTAS is continuously innovating itself by adding more testing capabilities. This continued refinement gives MTAS an edge over generic test automation solutions, making it one of the most preferred among QA engineers and developers. Purple Strike Real Time (RT) is an extremely powerful load testing solution on the cloud with intuitive user interface. You can automate real applications and run web applications from real browsers to generate real time load scenarios. Our high performance distributed real time load testing on cloud lessens your risk of app and website failure. We harness the cloud infrastructure to test your Windows, Web, and Mobile apps to increase time-to-market and to provide greater ROI. Provisions cloud servers and creates necessary infrastructure to manage, run, and monitor tests. Each agent initiates the load by opening and automating real applications. The brochure details features of MSys's test automation solution accelerator MTAS. This white paper discusses in depth what constitutes a detailed test automation plan that clearly sees business and application objectives.